The Witcher 2 is a marvelous game from top to bottom, so long as you’re prepared to invest many hours into understanding the game’s rich backstory and lore, search each area thoroughly for quests that often to do not provide map markers, and grind for certain items. If that first sentence sounded off-putting to you, then that’s probably a sign that the Witcher 2 is not for you. The Witcher 2’s story is an extremely epic one, spanning multiple countries and encompassing multiple branching decisions. As previously mentioned, no prior knowledge of the Witcher series is required to jump right into this installment, although fans of The Witcher 1 will be treated to a few cameos and dialogue references to the first game. Without spoiling anything, Geralt of Rivia must clear his name after he is framed for a murder which he did not commit, chase down the assassin, and uncover the rest of the plot behind it all. The story is quite good, being dark, mature, funny, and interesting all at once, although it sometimes becomes too detailed for its own good, becoming bogged down in fantasy mumbo-jumbo at times. This is because The Witcher is actually based off a series of novels and short stories by Polish author Andrzej Sapkowski, which were published in the 90’s. It’s hard to fault CD Projekt Red for being too ambitious in recreating the descriptiveness in Sapkowski’s work, but at times I felt like I was reading a fantasy book rather than playing an RPG video game due to the vivid detail and descriptions most NPC characters’ discussions will go into. Many players will appreciate this, but I found it to be a bit much at times. Another slight gripe I had with the story and writing aspect of the game was its treatment of female characters. Female characters serve almost entirely as eye candy, there so that you can seduce and sleep with them, or just for you to wish you could. I understand this is a fantasy game set in the middle ages, but really? Have a little class. This is the kind of game Anita Sarkeesian would be upset about. Other than the almost-too-descriptive details and the blatant sexism at points, the Witcher 2’s writing and dialogue are spot on. The voice actors all do a great job at bringing characters and environments to life, and the writing is well done. Most of the time the game’s tone is serious, but there are tons of hilarious bits of dialogues, characters, and even quests themselves to lighten the mood. The Witcher 2’s balance between humour and intensity is what makes the story so compelling. The Witcher 2 is not an open-world RPG, rather it is an RPG that is broken up into three main chapters plus a prologue, each with a large, fully explorable environment to complete tasks in and advance the story. Players cannot roam freely between these environments; once you leave an area, you likely are not coming back. This isn’t a bad thing though. The areas we do get to explore are vast and packed with content, from interesting NPCs, to fun mini-games, to engaging monster hunts. Nevertheless, this will still turn many players off of this game. If that’s you, don’t worry, the Witcher 3 includes a fully open world that you can explore at your own pace. But, back to the Witcher 2, of course. The aforementioned prologue does a great job at orienting new players with the world of The Witcher and some of its game mechanics. It perfectly drops the player into the Witcher 2, whether they have played the first game or not, by easing you into the story, but in an exciting way. That’s all I’m going to say on that, play on for yourself if you want to know why it’s so exciting! Many common elements of RPGs are present in the Witcher 2, namely this is a game where you complete quests, level up, find new gear, customize your skills in a skill tree, and of course, fight fantasy monsters. 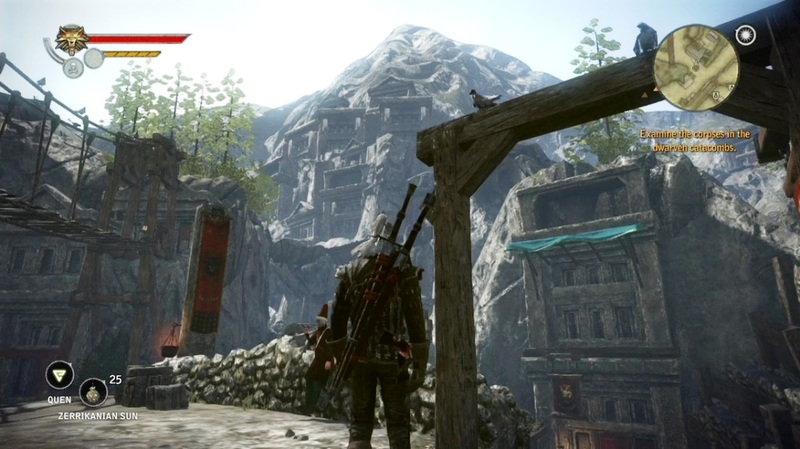 However, the Witcher 2 has a few unique gameplay elements of its own. One that many players will notice right away is that Geralt has two swords, a silver and a steel sword. The silver sword is used to take out monsters, while the steel sword is more effective versus human enemies. These swords can be switched out with left and right on the D-pad, making switching during combat a tactical necessity. This is one of my favourite parts about the Witcher series. The best equipment for Geralt will have to be crafted, so grinding for materials becomes an unfortunate reality for players wanting to max out their Geralt builds. Fortunately, most of the materials needed can be purchased, and if you’re a seasoned player of the Witcher 2, you can craft everything you need with little trouble. There is, however, a difficulty setting called Dark mode, that, regardless of player skill or knowledge, requires grinding in order to complete the game. Dark mode is the same game but much harder, and adds in three new armor sets called dark sets – one for each chapter in the game. These sets are pretty much required in order to complete the game on dark, and their material costs are outrageous. Translation: if you want to complete Dark mode, you’re going to need to do some grinding. Although you can’t change your character’s identity (You are Geralt of Rivia no matter what), all weapons and pieces of armor you equip change Geralt’s appearance. This is a huge plus in my books when it comes to RPGs. Certain weapons and armor sets can also be slotted with runes and other valuable materials to improve Geralt’s attributes and customize your character even further. 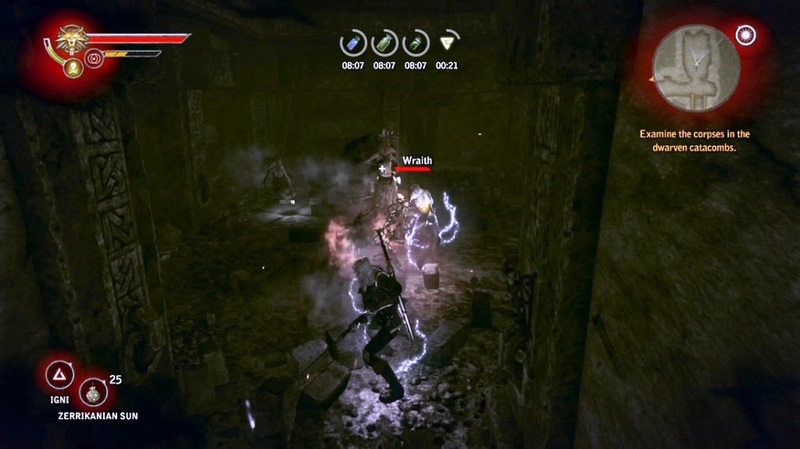 Combat in the Witcher 2 can be very challenging, but once you get the hang of it, it becomes fairly easy. Geralt can dodge roll, light attack, strong attack, block, use spells, bombs, traps, oils, potions, and other unlockable abilities to defeat his enemies. There are many ways to experiment with combat, namely combining melee and spell attacks. For example, you could stun an opponent with a well timed block, then send them flying over a cliff as they’re stunned using the Aard spell. Unfortunately, there are only 6 spells in the game (7 if you count the special sign unlocked in the last spot of the magic skill tree). 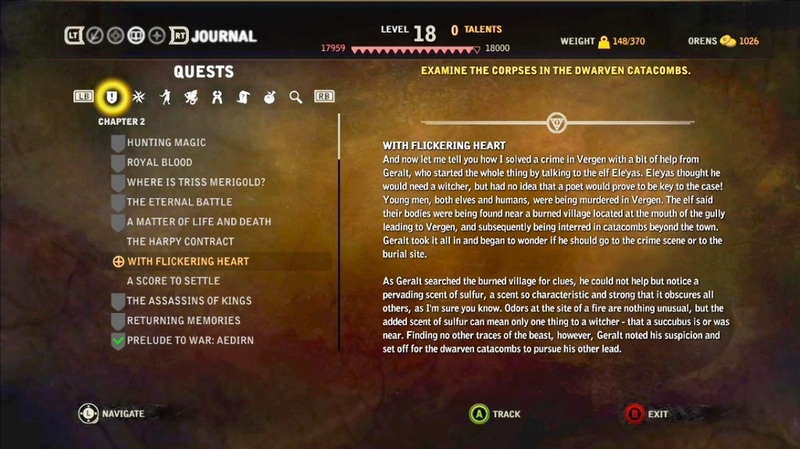 While the variety does work out fine, as every spell has its vital uses throughout the game, I really would have liked to see more spells for Geralt to use and upgrade. Levelling up is a standard affair, as you’re given a training skill tree and three main skill trees for you to invest your points into: Swordsmanship, Magic, and Alchemy. While I’m sure you can all picture what swordsmanship and magic are like, alchemy plays a bit differently, and brings a unique flair to the Witcher’s combat. Before combat, Geralt can brew and drink potions that give him advantageous effects in battle, such as gaining more health regeneration or being able to see in the dark. 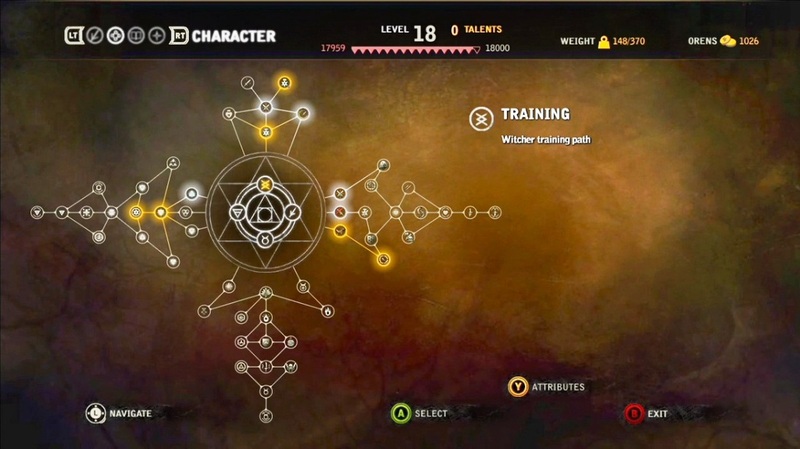 Alchemist builds capitalize on this even further, because as they put points into the alchemy skill tree, things like potion duration, effectiveness, and even bombs and traps crafted with alchemy will improve. One thing that will turn many people off of this game is that many of its quests do not have map markers. This means that some NPCs will give you quests that only give you a vague sense of where to complete them. I personally really enjoyed this mechanic, as it was a refreshing break from the constant hand-holding present in today’s video gaming scene. When I couldn’t find an objective, I would just move on to something else. When I did eventually find an unmarked objective, I felt much more satisfied than I would have if I had just walked to a map marker. And, when I failed a quest that didn’t have map markers because I unknowingly advanced the story too far, I wasn’t mad, because the game encourages multiple playthroughs in a big way. More on that in the replay value section. The quests themselves were very entertaining, for the most part. 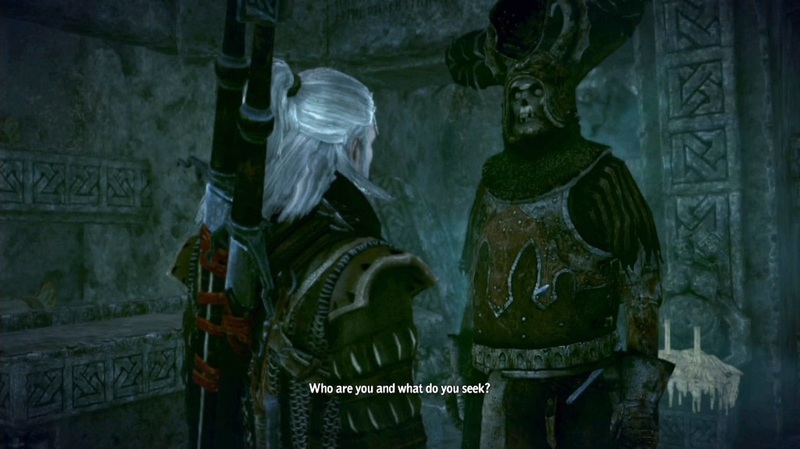 Not just simple fetch quests, the side quests in the Witcher 2 often task the player with venturing through new lands and forcing them to encounter new, crazy, funny, or dangerous characters. Almost every side quest feels memorable, a rarity in any RPG. One last mode in the enhanced edition that is separate from the main campaign is the arena mode. Arena mode lets players face configurations of enemies you won’t see in the main story, and even introduces a couple new enemies. After every round, you get to pick between three random pieces of gear to make Geralt stronger, and you get a skill point to level him up. You can even recruit three different party members to help you out. Arena mode is a great way for you to test out how certain skills are in combat, since the skills and equipment of this Geralt are completely separate from your main story Geralt. Unless you’re a massive fan of the game’s combat, or someone who always goes for high scores, you won’t really see the need to keep playing arena mode after you complete the thirty rounds and get the achievement. 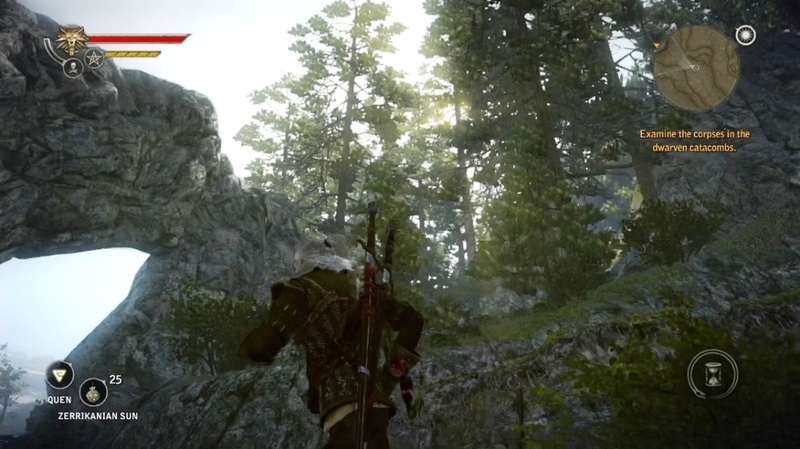 For a last-gen game released over three years ago, the Witcher 2 still looks stunning on an Xbox 360. You can tell that the art designers put the utmost attention to detail when crafting the environments of the Witcher 2, and it still blows me away how good a game can look on last-gen. Graphics alone should not make any game an instant purchase, but this one is close. Also, the sound and music in this game is excellent. Enemies emit terrifying and flat out gross noises when they’re near or you’re fighting them, constantly conveying a sense of dread to the player. The ambient noises in the game’s many towns/cities is organic and believable, adding to your overall immersion playing the game. There is also something to be said about the fantastic epic fantasy music pieces included during some of the game’s more epic moments. Just hearing a few notes from the game’s best pieces can transport you to Temeria, and adds further magnitude to the situation you’re faced with. The Witcher 2 is a unique game. Not only is it the epic, 30+ hour RPG I’ve been describing to you, but it’s also an epic, 30+ hour RPG with one playthrough. That’s right, the game encourages multiple playthroughs, and it does so in a massive way. Throughout your journey, you will be forced to make many tough decisions. Yeah, I know you’ve heard the whole make moral choices or don’t system present in games like Fallout 3 and the inFamous games, but the Witcher 2’s choices affect gameplay on a level I have not previously seen from many games. Depending on your choices, your entire experience with chapter 2 and 3 could be completely different from one playthrough to the next. And I really do mean completely different. For example, you could start chapter 2 in a completely different area with a completely different set of quests, but with similar overall goals as your last playthrough. Achieving similar goals but in completely new ways in a completely new environment is a fantastic way of extending the life of the game, and I applaud CD Projekt Red for doing so. I should note that there are many more smaller decision for you to make as you play through the game, but none are more significant as Chapter 2 being completely different. If you were expecting EVERY chapter to have multiple possible environments, then I’m sorry, you’re out of luck. Combine these alternate storylines, environments, quests, items, etc. with the game’s arena mode AND dark mode and you’ve got an extremely solid RPG package with many, many hours of replayability. If I were to guess how long it took me to experience everything this game has to offer and get every achievement, it would be around the 70 hour range. The Witcher 2 offers insane value for its meager asking price. If you’re able to invest many hours into understanding the game’s lore, and you don’t get bogged down by the game’s sometimes obtuse fantasy language and lack of quest markers at times, you will be in for a fantastic and original RPG. Tactical combat, expansive environments, clever solutions to quests, funny and intense dialogue, and deep customization options round out one of the finest RPGs of the generation, and one that you should not miss. January 22, 2017 in Curtis Walker, Guest Post, PC, Review, Xbox 360.